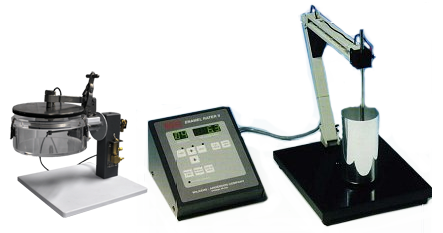 The MODEL 9524A Digital Can and End Enamel Rater System is used to test for deficiencies such as poor enamel coating by detecting and locating metal exposure in cans and ends. The 9524A provides an index of surface quality in terms of the amount of metal exposure by measuring current flow through the can or end and an electrolyte. A can is filled with an electrolyte solution, placed under the electrode and the electrode is lowered into the solution. An end is placed on the electrolyte-filled End Holder and rotated upside down. A test sequence is initiated and a direct reading of enamel coating quality is then obtained from the front panel digital display. This unit requires the use of Change Parts. Please see 9756 ; 9757 ; 9758 ; 9759 for futher information.